Assisting Modern Direct Democracy across Europe and the World. "How can we make our cities more global and democratic at the same time?" was the theme of the 2018 Global Forum on Modern Direct Democracy, attended by participants from around the world in Rome between September 26-29. The Initiative and Referendum Institute Europe (IRI Europe), founded in 2001, is a transnational think-tank dedicated to research, educate and promote procedures and practices of modern Direct Democracy. As a non-partisan, non-profit association, the Institute's main mission is to develop insights into the theory and practice of Direct Democracy among politicians, the media, NGOs, academics and the public throughout Europe – and beyond. IRI Europe cooperates closely with partners from civil society, governmental institutions and international players across the globe. The institute has developed a series of research activities linked to university research centers, including projects on comparative research, local direct democratic practices and transnational prospects. Since the early days IRI Europe publishes informational and educational materials including print and digital Handbooks, Guidebooks, Toolkits for free and fair popular votes (referendums), study reports or dedicated materials for schools. The Institute has also contributed to the Global Passport to Modern Direct Democracy, designed to promote the understanding of participatory rights for the active citizenry. In all its projects IRI Europe cooperates closely with partners from civil society, governmental institutions and international players including our sister institutes in Asia and the Americas as well as both governmental and non-governmental organizations across Europe and the world. Experts associated with IRI Europe support worldwide initiatives to promote modern forms of citizen participation. IRI Europe's activities include study Briefing Tours on Modern Direct Democracy in Switzerland and other countries, highlighting the procedures and practices of modern Direct Democracy – participants see and experience direct democracy first hand. With a comprehensive network of experts and correspondents throughout the world, the Institute is uniquely equipped to provide the know-how and the tools the world now needs. IRI Europe launched back in 2008 in partnership with international governmental and non-governmental organisations the Global Forum on Modern Direct Democracy process. It's eighth edition – the 2019 Global Forum on Modern Direct Democracy – will take place from 2 to 5 October 2019, in Taichung, Taiwan. The IRI Guidebooks to Direct Democracy offer a variety of entry-points into the subject: twelve introductory essays present the major contexts and challenges; the many factsheets serve to deepen the factual and analytical basis on a selection of specific themes; and the concluding surveys contain further materials, facts and links on the institutions and the practice of direct democracy around the world. 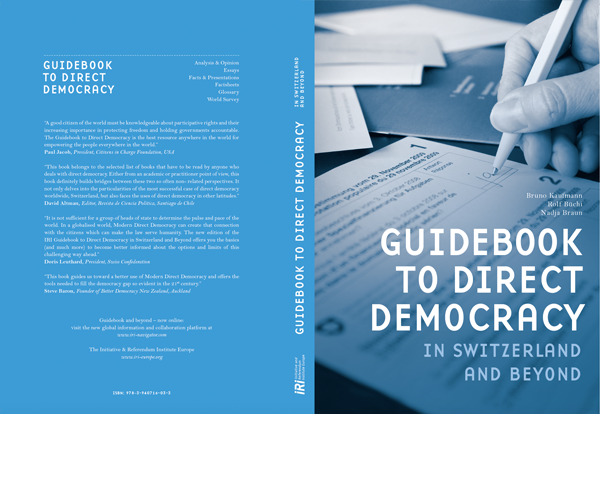 The Guidebooks do not restrict itself to Switzerland, however, but place that country’s rich experience within the European and global contexts, where the rights of political co-decision making are being extended to more and more people in more and more countries, going far beyond simply electing political parties and their re­presentatives to include the possibility of influencing the political agenda by means of initiatives, and deciding important substantive issues through popular votes. 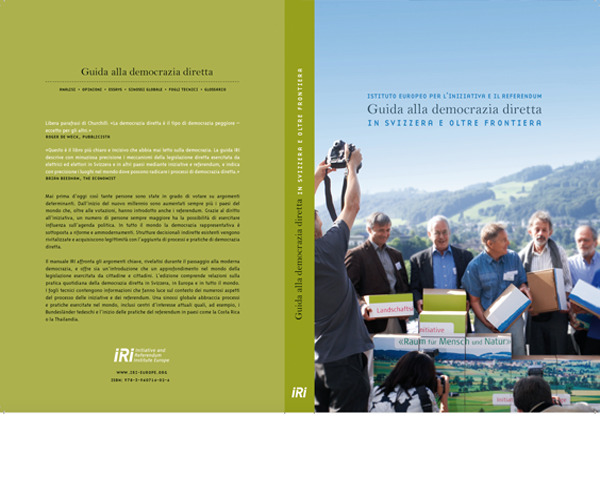 The IRI Guidebooks to Direct Democracy are available in nine languages. The contents represent the results of years of engagement on the part of the authors and editorial team. Many individuals and institutions have been involved, both directly and indirectly, in this work.